Are you ready to choose your own adventure? In Reno, where every hotel caters to a new crowd, there are plenty of ways to enjoy a weekend away. Whether you’re looking to win big on the tables or dance the night away, we’ve got the vacation for you. So how does it work? First, choose your vacation vice. Next, book the hotel. We’ve got you covered on everything to do inside—and outside—of the casinos. Feeling important? The Grand Sierra Resort—most commonly referred to by locals as the GSR—offers high-end dining, A-list entertainment, and bedrooms complete with wet bars and marble bathrooms. There’s no need to leave the hotel if you’re looking for delicious food. Inside the GSR is the Charlie Palmer Steakhouse, a luxurious restaurant voted the best steakhouse in Reno. Get ready for a gourmet meal; American-style steaks including a 42-oz Porterhouse prepared for two and sides ordered a la carte are the perfect pairing for the eatery’s extensive wine and cocktail list. Make a reservation if you want to dine in—it’s a popular choice for visitors and locals! Looking for good food with less fanfare? Step into Cantina, a fresh mex restaurant located in the hotel’s restaurant row. Here, classic cuisine including tacos, enchiladas, and chili rellenos round out the menu but the new inventions are just as tasty—think pork chops “al pastor style,” barbacoa, chicken mole, and halibut Veracruz. Wash it all down with a tequila flight. There are 115 varieties to choose from. Restaurant Row is also home to Rim (a pan Asian bistro), California Pizza Kitchen, and the Grand Café. Sip cocktails with dinner at any of the spots listed above before grabbing a nightcap at Reserve Wine Bar. The ambiance here is warm and inviting with a hint of modern romanticism. Choose sips from the 88 varietals available every day. The bar opens at 4:30 PM Tuesday-Saturday. Want to feel like a true VIP? Get table service at LEX, the hotel’s premier nightclub. A couple nights each week the bar is turned into a comedy club for before-hours entertainment. Then, the music starts. A few steps away the Grand Theatre offers concerts and other shows. On April 12 Hozier will perform and on April 19 it’s Sammy Haggar & The Circle’s turn to take the stage. On May 10, the theatre welcomes Willie Nelson. Just a couple streets over from the GSR sit two establishments prime for those who want to experience some of Reno’s favorite pastimes. Check out Reno Guns & Range for a chance to shoot targets with a collection of guns (some you can’t find in California) or stop into Mesa Rim next door for a lesson in rock climbing. The Row is the newly re-marketed collection of downtown hotels. When you drive into the biggest little city and see three giant buildings cloaked in colored lights, that’s exactly where you’ll be staying when you visit for the first time. Pick your poison. The Row is made up of three hotels, the Silver Legacy, El Dorado, and Circus, Circus. Each hotel is connected to the next through indoor walkways and escalators making it easy to traverse from one place to the next. You won’t run out of dining options while staying at The Row. This stretch of hotels features 25 eateries, 22 bars and lounges, and 11 nightspots. Looking for a classy steakhouse to satisfy your cravings? Roxy’s serves up steaks, seafood, and soufflés. Nearby, La Strada focuses on Italian cuisine in an inviting atmosphere. There is, however, no place like Ruth’s Chris Steak House for a lavish meal at The Row. Don’t leave the hotel just to be entertained. There may be a world of opportunity out there on the gritty streets of downtown Reno, but all the best stuff is right inside. On April 13, the Silver Legacy welcomes Academy Award winner Steven Wright live in concert and on May 4, the same hotel hosts a quartet of mariachi performers. Looking for comedic relief? The Laugh Factory is one of several venues specializing in comedy in downtown Reno (check out the GSR and Pioneer Underground for more offerings). Every week guests roar with laughter, as a new comedian is welcomed in. Craving the nightlife? Rum Bullions Island Bar is a dueling piano bar that features live music and DJs, and Brew Brothers serves up quality beer (and other libations) with bands and DJs switching off throughout the night. You’re located in the heart of downtown, which means there is plenty to see and do close by. Venture over to the river walk (a walkable distance from The Row) and take a stroll along the Truckee River. Visit The Eddy when the weather is nice to play lawn games, eat food truck pizza, and drink beer. A few doors down Bundox Bocce offers bocce ball, shuffleboard, over-sized Jenga, and a full bar at the Renaissance Reno Downtown Hotel. Want to take in a show? The Pioneer Center for the Performing Arts will host A.V.A. 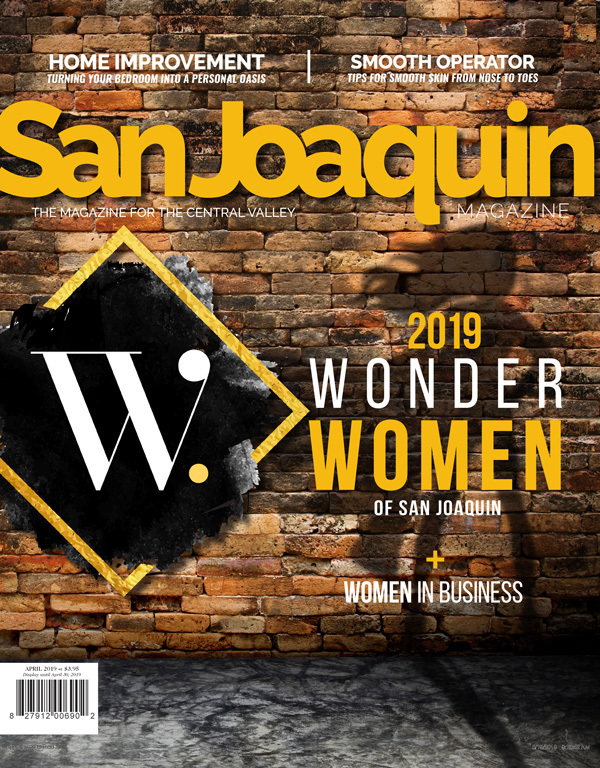 Ballet Theatre as they open the spring gala season with a rendition of Alice in Wonderland on April 13 and 14, and the Reno Philharmonic will perform April 27-28. Don’t forget to stop and pose in front of the Reno sign before you go! I bet you thought Reno wasn’t the place for you. Surprise, surprise! Located in the heart of downtown sits Whitney Peak Hotel, catering to a different crowd with its commitment to being both non-gaming and non-smoking. 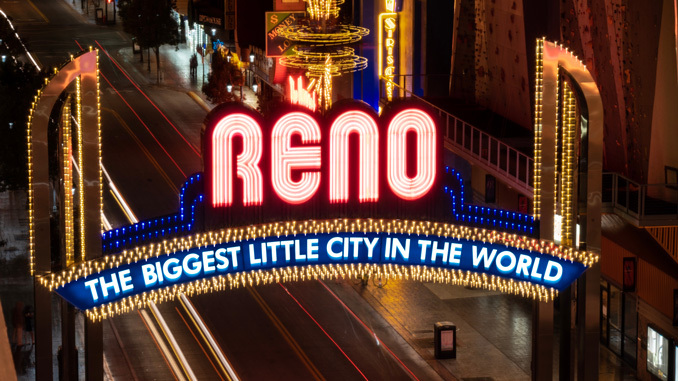 Step inside and see what the other side of Reno is all about. Roundabout Grill, located downstairs, offers an air of sophistication without the fuss. Step inside and grab a seat at the bar, or sit close to the open kitchen to get a glimpse of the chefs at work. The menu here is made up of favorites with a twist (think a goat cheese tart made with macerated fig, caramelized onions, and arugula or a seared salmon served over ginger-lemongrass risotto, green beans, butternut squash, and miso-glazed mushrooms). The best, however, is the snack board, a chacuterie that comes complete with meats, chutneys, crostinis, cheeses, and more. Have you ever driven through Downtown Reno and seen fearless climbers making their way up the side of a building? Well, that’s Whitney Peak hotel, and those climbers aren’t experts—they are likely patrons just like you. Inside Whitney Peak is Basecamp, a 7,000 square-foot climbing facility (complete with an area that caters to the tiniest of climbers). Outside sits the “World’s Tallest Artificial Climbing Wall,” allowing visitors to scale the side of the hotel just for fun. Take advantage of the hotel’s other amenities while you’re there and focus on wellness. A steam room and sauna are available to all hotel guests, and their fitness center has ranked in the top 10 hotel gyms in the world more than once. The Arizona Diamondbacks’ minor league team calls Reno home, and the season starts in April. Pick up tickets to a game (schedule available at milb.com/reno) to enjoy good beers and ballpark food. The Greater Nevada Field offers a fun place for posing outside and some good grub options. Drink before the game at Good Hops (and play shuffleboard) or eat at Bugsy’s Sports Bar. Looking for a Vegas-style hotel without traveling South? The Peppermill offers all of the luxury of a Las Vegas Resort right outside of Reno’s bustling downtown. Step inside to enjoy a high-end nightclub, amazing dining options, and a full-service spa. You can’t go wrong with a Peppermill restaurant. Reno is clearly becoming a foodie’s paradise, and many of the best dining spots are located right inside the Peppermill Resort. Dine on steaks and seafood in a plush dining room at Bimini’s, step back in time with traditional Asian delicacies and over-the-top décor at Chi, or take a quick trip to Rome with Italian fare at Romanza. Outside of the hotel sit more casual options for dining, but more on that later. Take advantage of the Peppermill Spa, a 33,000 square-foot sanctuary that caters to relaxation and rejuvenation. A single appointment grants visitors access to the entire grounds, including a Himalayan salt room, pool, spa, and spacious deck. In true Vegas fashion, it’s time to hit the tables. The oversized casino offers slot machines, video poker, and table games. Play a round of blackjack and pray for 21 while a server pours free booze. Don’t forget to look up from the cards every once in a while to admire the artwork. A team of talented photographers and videographers are working on compiling the largest library of worldwide scenery and the fruits of their labor are on full-display inside. To round out your very Vegas non-Vegas vacation, stop into Edge nightclub. It recently underwent a renovation to create a more intimate vibe without losing its dedication to authentic DJ culture. The last stop of the night should be at the Fireside Lounge. Slip into a comfy booth around an indoor fire table and order a cocktail to finish the night. Midtown is simply a hop, skip, and a jump away from the Peppermill Resort. The gentrifying area serves as a downtown, home to bougie bars and intimate dining spots. Traipse around during the day to enjoy the midtown murals—more than 80 pieces of art painted by local, national, and international artists. It takes approximately two hours to see them all, but don’t rush. Step into the local cafes and dessert spots to make the most of your time here. We suggest brunching at Two Chicks, grabbing coffee at Bibo Coffee Co., and drowning in dessert at Simple Ice Cream Sandwiches. For dinner you may want to grab a bite at Noble Pie where pizzas reign supreme (try the White Girl) or Midtown Eats. For drinks, sit fireside at Z Bar or indulge in the speakeasy vibe at Death & Taxes where stuffed black couches and candlelight set the mood. Atlantis Casino Resort Spa has spa right in the name—and there’s a reason for that. The state-of-the-art facility offers travelers a luxurious escape with plenty of options. Spend the day getting a rubdown at the Forbes Four Star Luxury Spa or rejuvenate tired skin with one of many revitalizing facials (consider the radiant papaya enzyme offering). Stick to the theme of refined opulence and wine and dine yourself at Bistro Napa. Fine wines and an elegant atmosphere compliment the tasty California cuisine. Want to have dinner with a view? The Sky Terrace Sushi Bar is located on the scenic sky terrace of the hotel. Here guests can watch sushi made with more than 50 types of Japanese sushi, nigiri, and maki available to try—and an all-you-can-eat menu. Next door the Oyster Bar offers similar views with a fresh menu. Once you’ve eaten all you can and fully indulged in the appointed spa, hit the pool. The Atlantis is the only resort in Reno that offers both indoor and outdoor pools so guests can enjoy swimming year round. When you’re done, hit the town; there’s plenty to see and do here! Reno is home to the National Automobile Museum. Tucked away near the Truckee River, this museum boasts 100,000-square feet of antique automobiles. Take a walk through history as you peruse cars grouped by age, old gas pumps, and other memorabilia. The biggest draw may be a Cadillac that once belonged to Elvis Presley. A couple of miles down the road in a nondescript shopping center sits We Olive & Wine Bar. Here, staff serves generous pours of artisan California wines plus olive oil-inspired tapas.